The Glen Moore Grist Mill provided grain to Washington's troops in Valley Forge. Established in 1975 by the Board of Supervisors, the Historical Commission was charged with the responsibility of researching and recording the Township's heritage. As custodian of this heritage, the Commission endeavors to preserve the historical integrity of the Township and maintain archives relating the people, buildings, industries, landscape and other pertinent information. Meetings are held on the 4th Monday of each month at 7 PM at the Township Building. If needed, work sessions are held on the third Monday of each month at 7 PM at the Township Building. One of the Historical Commission's first major endeavors in the recording of our local history was the release of the Township's history: Wallace Township: Born of Controversy in 1852 . Copies of this publication are available for sale ($8) at the Township Building. The Commission's latest project is a publication of the Wallace Township Historical Atlas , a collection of local maps from 1692 to 1998. The cost of the Atlas is $13. Please add $1.50 if you want the Atlas mailed to you. Do you enjoy history, old homes, barns, antiques, schoolhouses, churches, cemeteries, genealogy, or just talking about "old times?" Do you have old pictures, scrapbooks, postcards, yearbooks, letters, or other memorabilia to contribute? Would you be willing to share your memories through an oral history? Then, the Historical Commission would like to hear from you. Does your old (or maybe new) Wallace Township home have ghosts in the attic? We are collecting area ghost stories to put into a collection. Contact any member or e-mail the township with your stories of voices, noises or supernatural occurrences. Springton Manor Farm was settled by the Scotch Irish in 1725. If you are a descendant, please contact any Historical Commission member. Wallace Township was formed through a division of West Nantmeal Township in 1852. The Township—as defined by its current boundaries—includes nearly the same territory as the early eighteenth century Springton Manor, minus a small portion of land that was granted to Uwchlan Township in 1853. Township boundaries were slightly revised in 1860, when the lines abutting East and West Nantmeal Township were changed and a second adjustment between Uwchlan Township and Wallace Township was finalized. Archaeological and historical research indicates that Wallace Township's earliest eighteenth century inhabitants included remnants of the Brandywine and Okehocking bands of the Lenape Indians, who dwelt in the area from approximately 1720 to 1740. A Brandywine Indian burial site, excavated in 1952 and again in 1982, is currently owned and maintained by Wallace Township. The first official Wallace Township survey, completed in 1729, canvassed the 8,313 acre Springton Manor. Springton Manor, one of seven Chester County manors established as part of an agreement between Charles II and William Penn, was originally located in the Downingtown area. According to nineteenth century Chester County historians, J. Smith Futhey and Gilbert Cope, the first European settlers to occupy the early Springton Manor tracts were almost entirely of Scottish descent and "attracted to the area by the pure water, absence of marshes, and elevation of between five and six hundred feet above tide-water." Ultimately Penn's manorial system failed; by the time the Revolutionary War broke out, most Springton Manor settlers had been able to secure patents to their own tracts of land. Despite the fact that a committee of Springton Manor residents met with Philadelphia Govenor Thomas in 1744 and complained that they were being asked to pay too much for land that was "in poor condition" for crop production, agriculture represented either a primary or secondary source of income for most eighteenth century Wallace Township residents. Local harvest included corn, Irish potatoes, fruit crops (including apples, peaches, several varieties of berries, and grapes), wheat, and oats. Area farmers also tended livestock, including cattle, cows, pigs, and horses. The East Branch of the Brandywine and its tributaries, coupled with the area's extensive stands of hardwood forests, attracted forge and mill workers to Wallace Township. 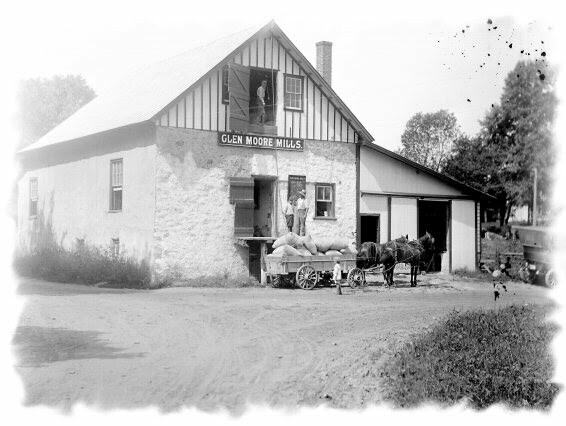 The Village of Glenmoore and the hamlet of Cornog developed as eighteenth and nineteenth century industrial centers because of their ability to support mill activity through ready water supply. In the south-central part of the Township, Robert McConaghey, an important early settler, began operating a forge in 1766. Springton Forge, located adjacent to what is now the County-owned Springton Manor Farm, was operated by a succession of owners for more than one hundred years; the Forge turned out superior-grade iron during the Revolutionary War and produced first-quality bars for blacksmiths and rolling mills well into the nineteenth century. Robert McConaghey has also been credited with building the 1769 saw and grist mill located near the corner of Creek and Devereux Roads. Wallace Township's less than efficient access to Downingtown, the area's closest center of activity, created a great demand for cottage industries. Wheelwright, blacksmith, cobbler, butcher, and coachmaker shops fulfilled the daily requirements of local residents. Taverns and inns served travelers and provided informal space for meetings. As early as 1810, a group of local residents "associated themselves for the purpose of erecting a subscription schoolhouse" at the intersection of Fairview and Indiantown Roads. After the Pennsylvania General Assembly passed the Free School Act in 1836, "Indiantown School" was opened to the public; the facility continued to support Wallace Township in an educational capacity for more than one hundred years. Additional early Township schools included West Nantmeal Seminary and Lincoln School on Little Conestoga Road, Glen Dale School on Indian Run Road, and Locust Grove School at Highspire and Marshall Roads. The advent of the railroad and main transportation corridors considerably altered the face of Wallace Township in the late nineteenth century. The hamlets of Cornog and Glenmoore, for example, developed substantially as a result of Downingtown and Waynesburg Railroad stops and a new major thoroughfare, Creek Road. Rail access also precipitated the conversion of eighteenth and nineteenth century farmsteads to summer estates. Summer residents included John Wanamaker, the Philadelphia merchant, who bought the large estate of "Glen Cairn" in 1888. Twentieth century influences have had a profound effect on the Wallace Township landscape. A segment of the Pennsylvania Turnpike was constructed through the Township in 1950 and late twentieth century residential subdivisions have replaced what was once productive agricultural land. Worth noting, however, is the Wallace Township Comprehensive Plan comment that "despite evolution from an agrarian countryside with one village and one hamlet to a proliferation of subdivisions," residents can still appreciate the area's past "because of the many symbols and artifacts which survive to reflect that heritage."